I’m so giddy to be able to share this finished project with you all! 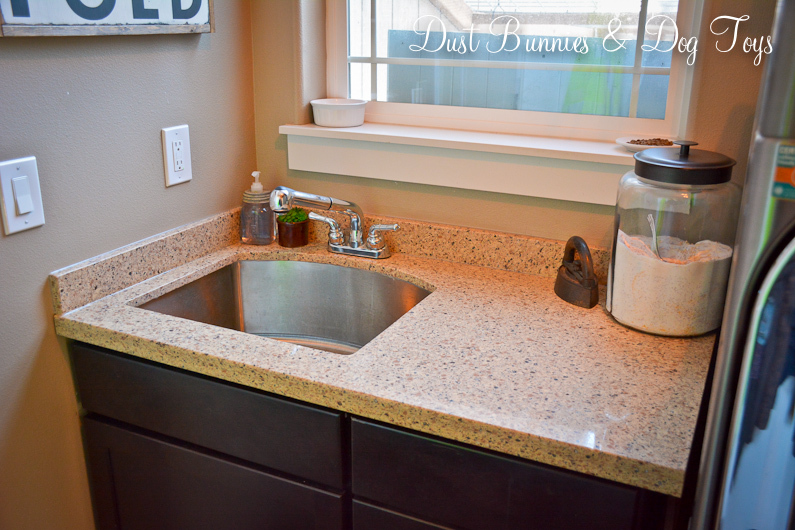 Remember way back to No-Spend January of 2015 when we installed this cabinet where the plastic sink used to be? 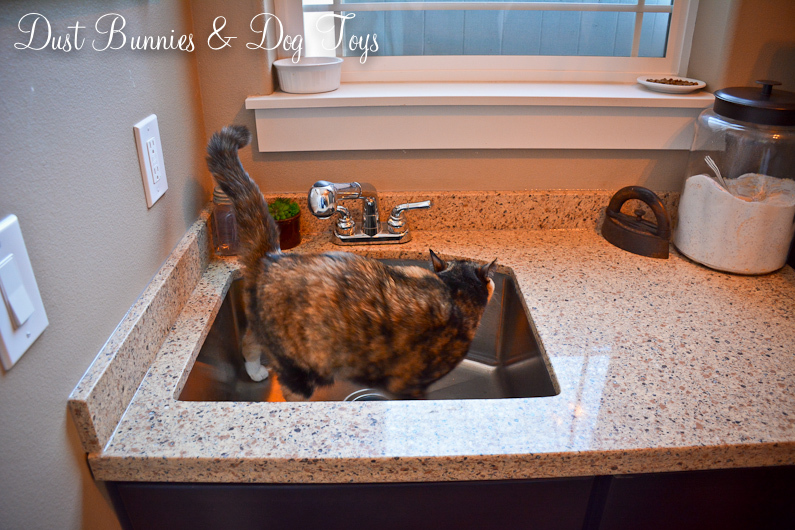 We’ve been living with a plywood top and no faucet for the sink since then which you’ve seen in a few posts like this. It functioned for what we needed and there were higher priorities to tackle but it secretly drove me NUTS. So why did this project take so long to finish? 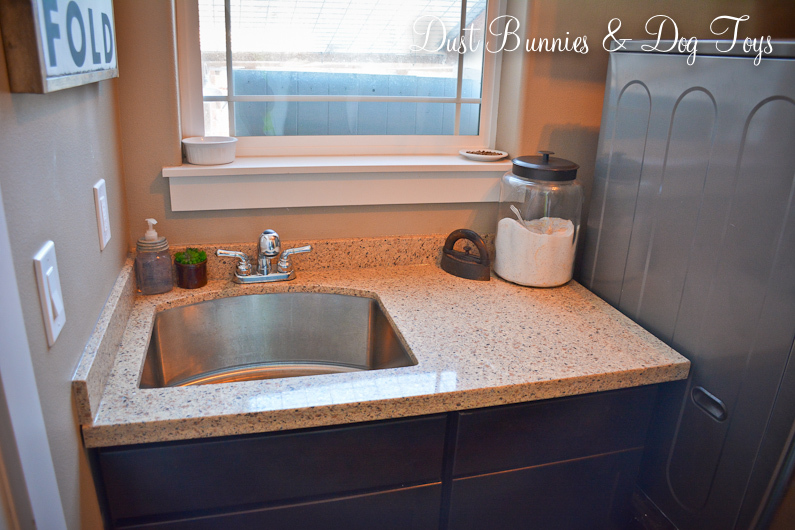 We had a remnant piece of granite to match the kitchen and bathrooms but needed it cut to size and finished with the sink opening. I’d attempted to barter the service with no luck and every quote we had gotten was insanely high – like in the range of you’d think they were selling us brand new marble counter tops rather than finishing material we provided. So the hunt continued. Until the Hubs found a vendor who was willing to cut the granite using a template we provided for just a couple hundred dollars! Miss Luna was not to pleased to have “her” space disturbed while we were installing the finished top, but she seems pretty ok with it now. Especially since it gives her another inch or two above her doggie siblings. 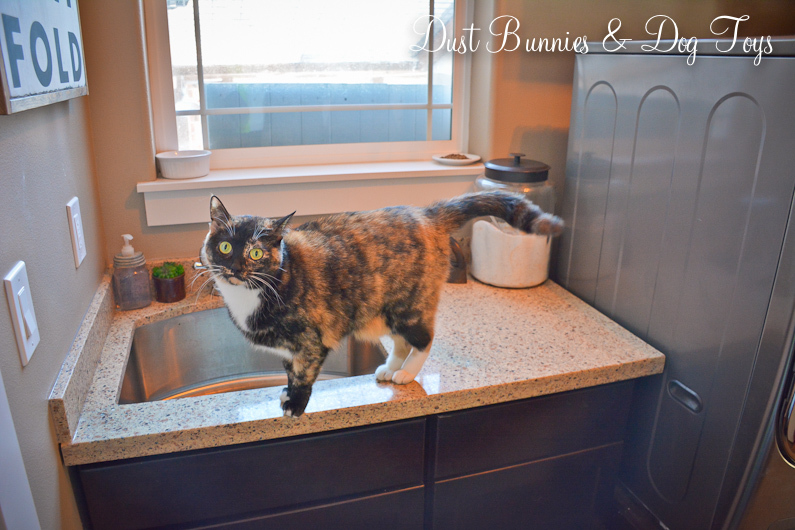 Here, she does an excellent job of showing just how deep that sink really is! 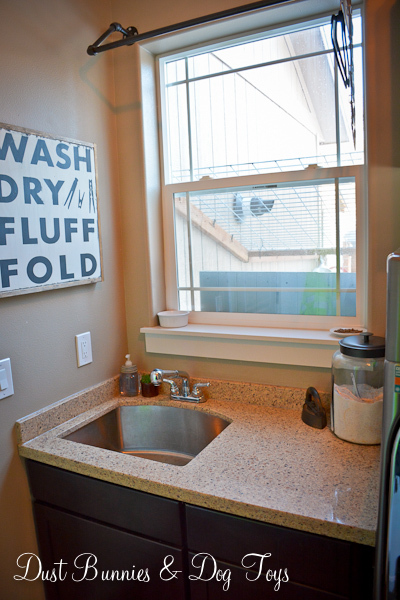 The finished top makes all of my existing decor and laundry products look even better. 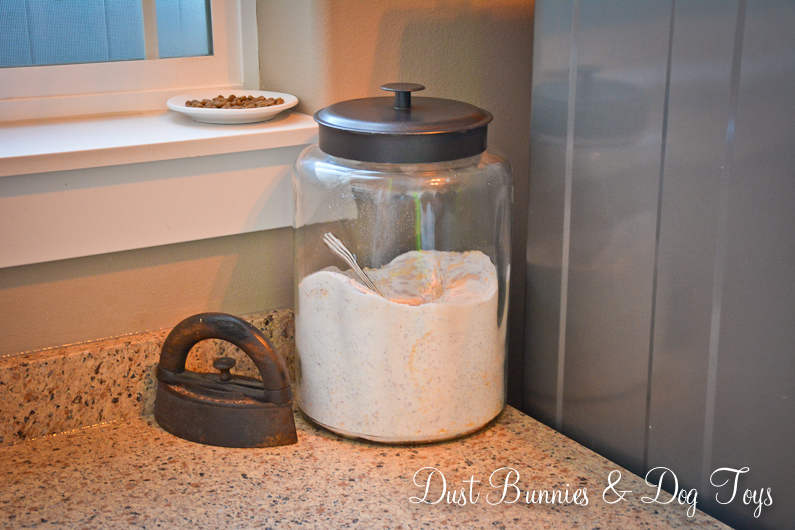 On one side is the vintage iron I picked up at the antique store and our DIY laundry soap container. 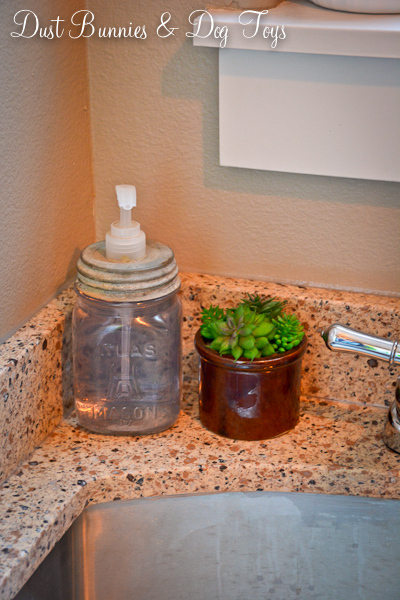 On the other is the last of our mason jar soap pumps – which I’ve been saving for this spot – and a simple little faux succulent planter from my recent spring project for a bit of greenery. We did have to replace the faucet because we discovered that the one we’d saved from the original plastic sink didn’t have long enough posts to reach through the granite and the pull out nozzle required an extra line that we didn’t have space for. So the Hubs picked up a bargain faucet for around $50 and got that installed quickly. I took all of these pics last weekend with the old faucet standing in for the photo op, but the new one looks very similar. Since we did the install ourselves, our total cost with the new faucet came in around $400, which was 100% worth it! 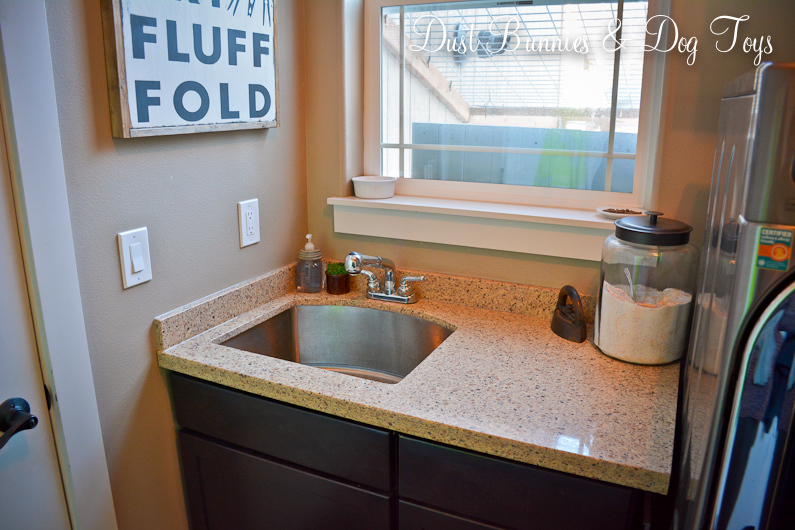 I still haven’t really used the sink much since I’m still getting used to having a working faucet in this spot, but I really love having the option and seeing this clean, finished space each day when we come home.